(All coaches are of metal construction. Also they are fitted with 2/3 rail wheels with switch-able 2R/3R pick-ups). 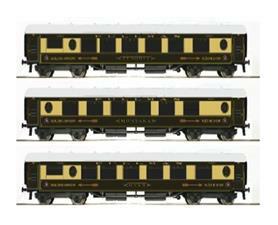 Ace Trains C/19A Golden Arrow Pullman Coaches Set A. Consists of 3 coaches. Zenobia 1st Kitchen, Montana 1st Brake, Onyx 1st Kitchen. Ace Trains C/19B Golden Arrow Pullman Coaches Set B. Consists of 3 coaches. Trianon Bar, Niobe 1st Parlour, Adrian 1st Kitchen.